The following defensive stunting techniques came from the Encyclopedia of pick and roll defense playbook assembled by Chris Filios for Scott Peterman’s Basketball HoopScoop. 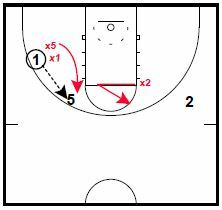 It is paired with The Comprehensive Ball Screen Playbook as this week’s featured bundle. You can find out more about the bundle by clicking on this link: Encyclopedia of Pick and Roll Defense & Comprehensive Ball Screen Playbooks. If the screener is not a perimeter shooting threat and is a limited play-making threat, the defense will use a standard stunt. 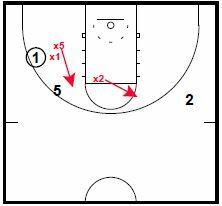 In a regular stunt, x2 will stunt/bluff at the ball as it is arriving to pop man/screener. On the catch, the big will see the guard motioning toward him creating indecision in the big. x2 will not over or fully rotate to the ball. It is a couple hard steps at the ball and recover back to his man. If the big is not a great shooter or perimeter threat…the defensive will give a quick stunt. As guard is picking up dribble, the defense will quickly stunt at the popping big. 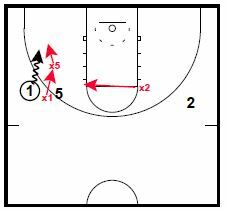 This will create indecision with the ball-handler and buy time for the defensive big to get back to his man. This will also be used in case the defensive player stunting is guarding a good perimeter shooter. *This is slightly different from a regular stunt as the stunt occurs PRIOR to the guard picking the ball up. In a regular stunt coverage, the help side defender will stunt as the ball is arriving to the pop man. If the big is good perimeter shooter, the defense can “hold” stunt. The guard rotating will stunt at the ball and will stay until defensive big can recover to the ball. 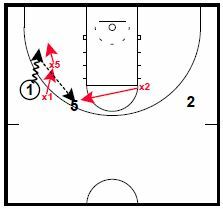 This should force the offensive big to become a non-threat, thinking pass. This is another option when guarding against a skilled big that is a threat from the perimeter. It can also be used in an emergency situation. In this case, instead of the defensive big recovering to his man he and the other help defenders are forced to rotate as the ball is moved.